You’ll have to take a trip up the Bosphorus to visit this museum, past curving harbors dotted by waterfront mansions, colossal official buildings and consulates, and picturesque little seaside cafés. 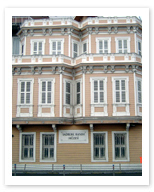 The first private museum to open in Turkey (1981), the Sadberk Hanim Museum’s collection spans the length of two typical Bosphorus yalis, or waterfront mansions. Exhibits here include artificacts arranged chronologically from the late Neolithic period (5400 BC) onward, including large displays of Roman gold jewellery, a beautifully arranged ethnography section, Byzantine crosses, Greek and Phrygian metalwork and pottery, and Assyrian cuneiform tablets. If you have already visited the Grand Bazaar, you may be delighted to hear that many of the treasures on display were found hidden there and at other Istanbul markets. If not, maybe this great collection will give you an idea of what to look for.